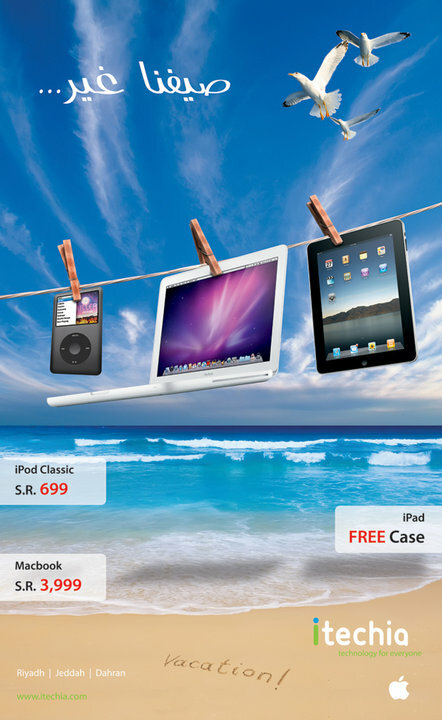 Here’s the summer promotion by itechia stores in Saudi Arabia as posted on their facebook page. iPod Classic for 699SR, MacBook for 3,999SR and a free case with your iPad purchase. Itechia have branches in Riyadh, Jeddah and Dahran. If you know of any other promotions by a Mac retailer in Saudi Arabia then please tell us. This store is a known cheater. The bold manager was in Compume back in 2003. I bought a new VAIO from him, and when I got it home there were chat logs and browsing history!!! I went once to itechia to buy an iMac, and asked for the higher configurations. The same bold manager said the price was so and so. When I got it, while paying using the credit card, I looked at the box and found that it was the lower configurations!!!! AVOID HIM. Thanks a lot Tareq for that valuable information. does any one knows apple store in Madina other than Jarir, because they absolutely have no idea about macs, I want to upgrade to mac pro 13″, can any body help me? Jarir is no longer an apple distributor. The best way to buy apple products is to ask someone abroad to ship to you. I was in the US, and I converted one friend to Mac. He then converted about 50 of his relatives and sent them macbooks through mail. I suggest avoiding Fedex and UPS. Instead, use normal mail service like USPS in USA. Very reliable. but what about the Arabic characters on the keyboard buttons?! and how much it will cost me for shipping from the US?! How much does the iPad 16GB cost at itechia?? Can anyone tell me how much the iPad 16GB cost at iTechia because Â I am planning to buy it from iStyle for 2400 riyals but I saw this offer so I wonder how much the price is at iTechia?? Both IZONE and Istyle are APPLE Premium Resellers. why oh why would you buy from anyone else???? Jarir is no longer an authorized dealer, making them a “gray market” Apple dealer. As I said in the post, if a store is having a promotion then please contact us, vendor websites here are horribly designed and I couldn’t find anything useful. Khaled, I am not with or against any of those shops in Saudi Arabia. IMHO I think both itechia and izone are big cheaters, or at least I can call them opportunistic. I lately went to izone in panorama mall and saw how ridiculous their prices are. Just like itechia. And BTW, ARAMCO buy from itechia?? HAHAHA :|. I would walk naked in the street if this is true! I have lived the last 5 years out of Saudi Arabia, between Singapore and the US, and I saw what customer service and consistent corporate policy mean. I will NEVER buy a macbook, ipad, ipod, or even an accessory from any where in an Arab country. I am fortunate to be a frequent traveler to where I can get Apple products at global warranties and at the normal global stores. I dont really care about getting the apple product a week after its release date! To conclude, if you can travel and get your gadgets, please do. If not, I would still shop from abroad and pay for the postage. In the mean time, I would keep sending emails to apple until they decide to open an official apple store in Riyadh. You may learn a lesson from Shawshank Redemption. It’s a movie. You should watch it if you have not. I was at iTechia in hayat mall last week. Despite of what people said, i went to visit the store. And it confirmed every single horror stories i heard…not just the price…but the people and management there too. As I entered the store, they say I can’t enter with baby stroller….like WTF?? The guy said you can leave the stroller by the door…and he expects me to leave my son sleeping by himself at the door…. WTF? I questioned them but they said it is the management policy….so I said to them “you and your management are all stupid” …than I walk off. The worst store I’ve encountered in my life….ever. @ nabil , so do not buy anything Â at itechia because ITECHIA robbing everyone , robbing every arab all customers askn double the price not good management,.